After three longs days of player Event #37: $5,000 Limit Hold'em of the 2013 World Series of Poker has played down from a starting field of 170 players to a champion. That man is Michal “Big Store” Moore, who outlasted a tough final table that included Ronnie Bardah, Greg Mueller and Justin Bonomo to win his firth bracelet and a $211,743 first-place prize. 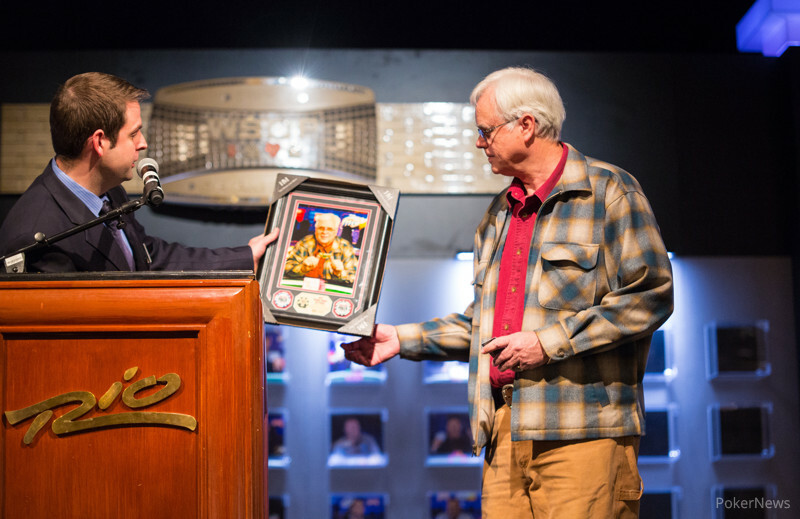 Moore, who finished tenth in the 1995 WSOP Main Event for $27,680, finally captured his long-sought-after bracelet and tripled his WSOP career earnings in one fell swoop. It took about 20 minutes for the first elimination of the day, and it was no surprise that it was the short stack to fall. Jeffrey Yass managed a couple of doubles at the start of play, but it proved too little too late as Bonomo sent the man from Haverford, Pennsylvania home in 12th place. In the next level, Jan Sjavik and Steve Landfish were felled in 11th and 10th place respectively, bringing about the official final table of nine. It took a long time for the first final table elimination, but it came on Hand #57 in Level 22 (12,000/24,000 limits) when Bonomo’s failed to overcome the of Mueller. Unfortunately for Mueller, his momentum would be short lived as he was the next to go on Hand #78 of the final table. Mueller, who made his third final table of the 2013 WSOP, was denied his third limit hold’em bracelet when he was eliminated in seventh place—which wasn’t quite as good as his two third-place finishes in the weeks prior. Still, it’s been a heck of a summer for “FBT”. Just two hands later, Ben Yu was sent to the rail in sixth place courtesy of Todd “Dandruff” Witteles. He was no doubt disappointed, but given the fact that he started the day on the second shortest stack he likely took solace in the $31,264 prize money. It took a long time for the next elimination to occur and it didn’t happen until after the dinner break. With the limits at 25,000/50,000 two players hit the rail in back-to-back hands. The first to go was Dom Denotaristefani, who grew short and fell to Bardah on Hand #171. The very next hand 2005 WSOP limit hold’em bracelet winner Witteles followed him out the door after his pocket sevens failed to win a race against Brian Aleksa’s king-queen. Ten hands later it was Aleksa’s turn to go, and then the last bracelet winner in the field, Bardah, was eliminated in third place on Hand #199. Gabriel Nassif, a member of the Magic the Gathering Hall of Fame who was at one point down to just 40,000 six-handed, entered heads-up play with a 2-1 chip lead over Moore. Even so, the man from the small town of Agar, South Dakota (Pop. 72) used his well of experience to chip away at his opponent and take the chip lead over the course of 134 hands. Then, on Hand #334 of the final table, Moore finished off Nassif to complete the come-from-behind victory. 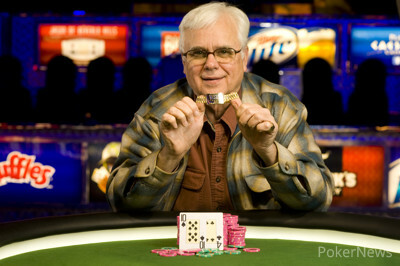 Congratulations to Michael “Big Store” Moore on winning the $5,000 Limit Hold'em event here at the 2013 WSOP. While Event #37 is complete, there is plenty of great tournament action to follow throughout the summer. Check out our live reporting section for more details. Hand #321: Michael Moore raised from the button and Gabriel Nassif folded his big blind. Hand #322: Nassif opened with a raise and Moore three-bet the action. Nassif called and the flop came . Moore fired out a bet and Nassif folded. Hand #333: Moore had the button and raised the action. Nassif folded his cards. Hand #334: Nassif raised from his button and after a series of raises, Nassif moved his short stack all in for his tournament life. The hands were turned over as we headed to the flop. The dealer rapped the table and produced the , which caused Nassif's rail to go into a frenzy as he secured the lead in the hand. All of that changed on the turn, however, as the paired the board and gave Moore trip tens and a tight grip on winning the tournament. Moore was one card away from victory and he secured it after the finished off the board. Nassif was eliminated in 2nd place and will collect $130,852 in tournament winnings. Hand #312: Michael Moore got a walk from Gabriel Nassif. Hand #313: Moore returned the favor and gave Nassif a walk. Hand #314: Nassif raised the button to 100,000 and Moore called. The flop saw Moore check-fold to a bet. Hand #315: Nassif received a walk. Hand #316: Nassif raised the button to 100,000 and Moore three-bet to 150,000. Nassif called, the flop came down and Moore bet 50,000. Nassif folded. Hand #317: Moore raised and took down the pot. Hand #318: Nassif raised to 100,000, Moore called and the flop fell . Moore bet, Nassif called and the turned. Moore check-called a bet of 100,000, the completed the board and both players checked. Nassif tabled the for a pair of tens and won the pot. Hand #319: Moore raised to 100,000, Nassif called and the flop came down . It went check-bet-call to the , at which point it went check-bet-fold. Ship it to Moore. Hand #320: Nassif raised to 100,000 and then called when Moore three-bet to 150,000. The saw Moore lead out, Nassif raise and Moore call. Moore fired out on the turn and Nassif folded. Hand #310: Gabriel Nassif raised from his button and Michael Moore called. The flop came and Moore check-called a bet. The turned and Moore checked. Nassif bet out and Moore surprised Nassif with a raise. Nassif mucked his hand and Moore took down the pot. Hand #311: Moore had the button and popped up the action. Nassif three-bet and Moore called. The two saw fall on the flop and Nassif led out. Moore called and the hit the turn. Nassif bet out again and Moore stayed around. The rivered and Nassif checked. Moore moved a bet out and Nassif raised the action. Moore three-bet and Nassif leaned back and put his hands on his head. He stopped for a moment and took a sip of his water. A minute passed before Nassif tossed out a call. Moore showed for trip deuces and Nassif mucked his hand. Hand #304: Michael Moore received a walk. Hand #305: Moore limped and Gabriel Nassif checked his option. The flop saw Nassif bet, Moore call and then both players checked the turn. They did the same on the river and Nassif showed the for a pair of tens. Hand #306: Nassif raised and won the pot. Hand #307: Moore raised to 100,000, Nassif called and the flop fell . It went check-bet-call to the turn and Nassif check-folded to a bet of 100,000. 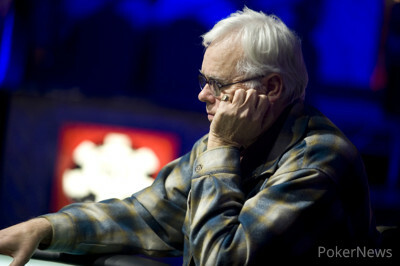 Hand #308: Nassif raised and then called when Moore three-bet to 150,000. The flop saw Moore bet, Nassif call and the turn. Two checks brought the river and Moore bet 100,000. Nassif raised to 200,000 and Moore called. Nassif tabled the for a flush, which beat Moore's . Hand #309: Moore raised the button, Nassif called and the flop brought a check-bet-raise-call. The turn saw Nassif lead out for 100,000 and Moore folded. Hand #300: Gabriel Nassif raised from the button and Michael Moore called. The flop came and Moore-check folded to a bet. Hand #301: Moore raised his button and Nassif called. The flop came and Nassif checked. Moore led out and Nassif folded. Hand #302: Nassif raised on the button and Moore made it three bets to go. Nassif called and the flop brought . Moore continued out with a bet and Nassif called. The fell on the turn and Moore bet out once again. Nassif folded and Moore dragged in the pot. Moore showed an as he stacked his new chips. Hand #303: Moore popped it up from his button and Nassif three-bet from the big blind. The two saw hit the felt and Nassif shot out a bet. Moore flat called and fourth street brought a fourth heart- the - to the felt. Nassif bet again and Moore called. The rivered and Nassif moved one last bet forward. Moore called and then mucked after Nassif showed for the nuts. Hand #276: Gabriel Nassif raised the button to 80,000 and Michael Moore called from the big blind. The flop saw Moore check-call a bet from Nassif, which brought about the turn. It went check-check to the river at which point Moore bet 80,000 and Nassif folded. Hand #277: Nassif received a walk. Hand #278: Moore received a walk. Hand #279: Moore raised to 80,000 and won the pot. Hand #280: Nassif raised to 80,000 and won the pot. Hand #281: Moore raised to 80,000, Nassif called and the flop came down . Nassif checked, Moore bet and Nassif sprung to life with a check-raise. Moore folded as Nassif showed for two pair. Hand #282: Nassif raised to 80,000, Moore called and the flop fell . Moore check-called a bet, the turned and Moore check-raised to 160,000 after Nassif bet 80,000. The call was made and the completed the board on the river. Moore bet and Nassif called. Moore flipped over the for two pair and it was good as Nassif mucked. Hand #283: Nassif received a walk. Hand #284: Nassif raised and Moore folded. Hand #285: Nassif received a walk. Hand #286: Nassif raised to 80,000, Moore called and the flop came out . Both players checked to the turn and Moore bet 80,000. Nassif raised to 160,000, Moore called and the completed the board on the river. Moore check-called a bet of 80,000 and mucked when Nassif tabled the for trips. Hand #287: Moore raised the button and Nassif folded. Hand #288: Nassif raised to 80,000, Moore called and the flop fell . Moore check-called a bet of 40,000, the turned and Moore check-called a bet of 80,000. Moore bet 80,000 on the river and Nassif folded. Hand #289: Moore raised the button and Nassif folded. Hand #290: Nassif opened for 80,000, Moore three-bet and Nassif called. The flop saw Moore bet, Nassif call and the dealer burn and turn the . Moore bet and Nassif folded. Hand #291: Moore folded the button. Hand #292: Moore raised the button to 80,000, Moore called and the flop came down . Moore check-called a bet, the turned and Moore check-folded. Hand #293: Moore raised to 80,000, Nassif called and the flop fell . Nassif check-called a bet from Moore and the turned. Both players checked and the completed the board on the river. Again they checked and Moore's was beat by Nassif's . Hand #294: Nassif raised, Moore called and the flop came down . Moore check-called a bet, the turned and Moore check-folded to a bet from Nassif. Hand #295: Moore raised to 80,000, Nassif called and the flop fell [qohqh9c]. 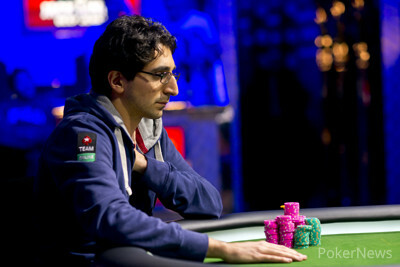 Nassif checked and then folded when Moore bet 80,000 from the button. Hand #296: Nassif raised the button and Moore folded. Hand #297: Moore raised, Nassif called and the two saw a flop of . Nassif checked, Moore bet and Nassif check-raised. Moore folded. Hand #298: Moore got a walk. Hand #299: Moore raised to 80,000 and received a call from Nassif. The flop saw Nassif check and Moore bet 40,000. Nassif popped it to 80,000, Moore made it 120,000 and Nassif called, bringing about the turn. Nassif checked, Moore bet 80,000 and Nassif called. The brought a check-call from Nassif and he mucked when Moore rolled over the .